I love social media. I live social media! As in, I literally make a living off of it. There are always new mistakes to be made, fumbles to be fumbled, and don’ts to learn (the hard way). 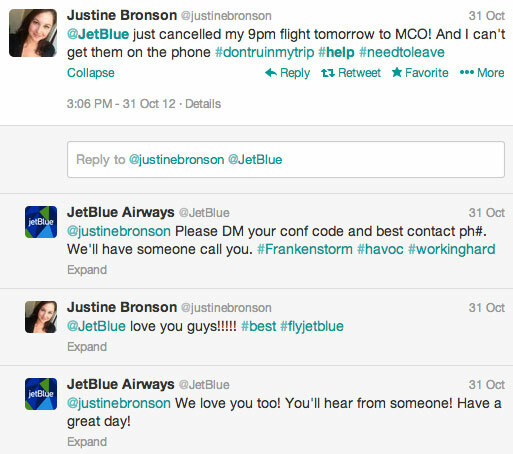 But some social media lessons are learned the easy way. Say, from reading a blog post. Here are six social media marketing don’ts that need to be kicked to the virtual curb. Ever follow a person or company on Twitter, only to have a message arrive in your inbox one nanosecond later with a “Thanks for following!” and a nod to their website, Facebook page, blog or [insert self-promotional link here]? FOR THE LOVE OF ANIMATED GIFS, PLEASE STOP. Automated messages are my #1 social media pet peeve and I’m willing to bet I’m not alone. Only that bet would be rigged, because I know I’m not. Sorry automated messages, but nobody likes you. @digiphile I consider it spam. Typically I unfollow anyone sending me a thank you DM. It is not personal & makes me think u have an agenda. I get that on paper, they seem like a great idea. Engage with your followers immediately! Show them your helpful content! Lead them to your website! Win-wins all around! Sure. But you know what else sounded good on paper? QR codes. In reality, automated messages come off as lazy, detached and out of touch. While I’m sure there are people out there who swear that automated messages have grown their follower count or resulted in a lead, the risk of leaving such a bad taste in your followers’ mouths just isn’t worth it. For every response you get, there are likely 50 other people like me who silently cringe and wonder when you’ll get the memo. There are no hard-and-fast rules for social media, but one thing that remains constant is that genuineness wins when it comes to earning the trust of your community and building relationships with them. And those canned, self-serving, abundantly-clear-there-is-no-real-person-sending-it messages are anything but genuine. Real engagement isn’t automated. On Twitter, skip the canned auto-replies. No one likes them. Hashtags are synonymous with social media itself – they’re great for categorizing your posts, finding and jumping into conversations, giving your campaigns their own special theme, or inducing a slew of eye-rolling when used in offline conversation. But just as one realizes when reaching the bottom of a movie theater-sized package of Skittles, too much of a good thing can often be a bad thing. Piling on the hashtags will either convolute the message you’re trying to get across or make it look like you’re desperately gunning for new followers instead of engaging with your current audience. When it comes to Twitter, try using no more than two hashtags per tweet. And be strategic about it. Hashtag the most targeted keyword in your message or find ones that apply to it. For instance, I’ll often slap #yvr onto any Vancouver-centric tweets from Unbounce’s account — and leave it at that. Are you guilty of over-hashtagging on Twitter? You could be convoluting your message. Not to be confused with my arch-nemesis automated messaging, automated publishing – scheduling posts to be published at a later time – is the best and essential for anyone working in or with social media. Automated publishing saves a ton of time, energy and gray hairs (shout-out to Buffer and Hootsuite for making my job that much easier). I’m assuming the update above was triggered from Twitter to simultaneously post to LinkedIn (where I found it), which resulted in a strange “0 comments” image being pulled and the inclusion of a hashtag on a platform that doesn’t support them. Womp womp. If you’re sharing to your personal accounts, you may not care about formatting, but for businesses it’s important to optimize posts for where they’re going to be posted. Each social network is its own beast with its own rules, and making sure your updates display properly puts you one step closer to more clicks and more engagement. If you blanket publish across social media networks, people notice. Tailor posts for each channel. A vibrant image on Facebook or tagging the right people on Google Plus can make all the difference. Plus, it just shows that you give enough of a s@#$ to provide a more appealing experience for your audience. Thumbs up to giving a s@#$! 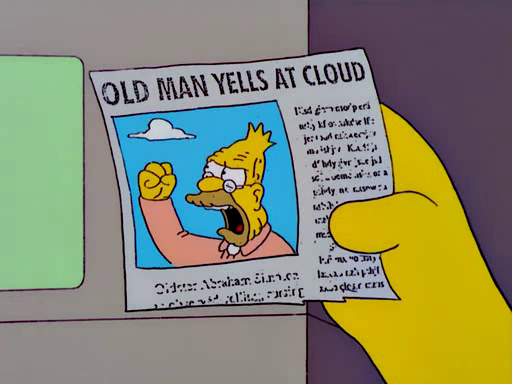 We’ve all been privy to the wonder that is the internet troll – the online equivalent of an angry Grandpa Simpson. I’m talking about the not-so-nice comments, frustrated questions or criticisms from regular people that any business has to deal with. Responding to negative feedback is tough, and it can even be a bit intimidating when dealing with an especially irate person. It helps to remember that most people are reasonable and just want to be heard. A calm, prompt, and most of all, human response can go a long way. The above example is admittedly extreme (most of us have enough common sense not to insult our customers). But a response with even a hint of contempt or listlessness — or straight-up not responding at all — can do a lot of damage to your relationship with your customers and brand reputation. Talk to people like they’re people and do what you can to address their problem, whether that means clearing it up yourself or putting them in touch with a team member who can. If you’re doing your best to understand where people are coming from and help them, that will come through. Pro tip: When in doubt, channel the spirit of Amy’s Baking Company and then do the opposite. 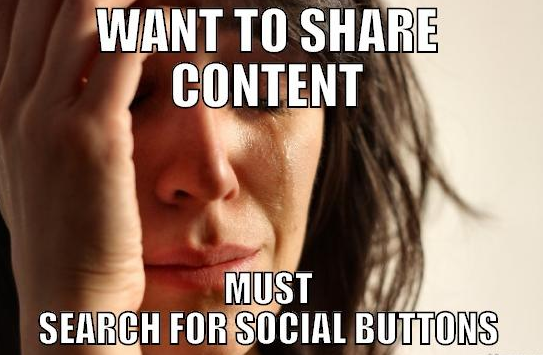 Curating content for Unbounce’s social community is a big part of my job. I visit a ton of different blogs each day, ready to share the good stuff with our audience. The funny thing is, a lot of blogs don’t seem to be ready for me. I know, I know — if these are my problems, then my problems aren’t real problems. And the Buffer extension mostly takes care of this non-problem, on my end. But from one marketer to another, it’s just good sense to have your content be as easy to share as possible and optimized for doing so. That means putting sharing icons front and center, making sure the title of the post or a custom message is pre-filled (and under 140 characters with the link), and including your company handle so you’re credited by default. If you don’t have sharing icons installed already, try AddThis or ShareThis. Obviously we’re all about landing pages here at Unbounce, but it’s not just because they pay the bills. It’s because they serve a real purpose and serve it well. Landing pages allow you to send visitors to a super-targeted page that addresses their specific wants or needs. If you’re a software company running a Facebook ad for your newest feature, sending the people who click on that ad to your homepage – which probably has a lot of general information about your product and a high attention ratio – will just leave your visitors confused and likely to bounce. By sending them to a landing page focusing solely on that new feature with one call to action urging visitors to try it out, your chances of converting them increase dramatically. For a more detailed explanation (with examples! ), check out Tia Kelly’s awesome post on why sending social traffic to your homepage will leave you forever alone. The landscape of social media will always be changing and with it, its best practices for engaging with and building our communities. As we learn what works and what doesn’t, it’s up to us to weed out the bad tactics and focus on the good ones. In other words, find what works. And then keep doing it. What am I missing here? Any social media marketing pet peeves you want to add to the list?